So there is the Big Destruction, the one everyone in Susya and in al-Khan al-Ahmar knows will happen, the one everyone fears, and there are the Little Destructions along the way, the tremors that presage what is to come, as if the army were testing the water. ‘Azzam Nawajeh, whose home is on the demolition list, says he wishes they would do the big one already; waiting day after day, for many months, in the certainty that they will come, is torture enough. This morning we thought it was happening, but in the end what we saw were two Little Destructions. They were awful. You who are reading these words probably know about Susya and al-Khan al-Ahmar. You know that for years the government has been eager to wipe out both villages. Over the years, we were able, again and again, to save Susya. Now times are worse. The Israel High Court of Justice approved the immediate demolition of seven structures in Susya and of everything in al-Khan al-Ahmar. That includes the beautiful school that I wrote about in my last dispatch. This week the brutal drama of al-Khan al-Ahmar began. But last night and today I was in Susya, and I will tell you what I saw. You may know about these places, but how many of you have spent an evening with a family whose home will be killed tomorrow or the next day? It’s a special mode of time, unlike any other. You wait in bitterness and terror. Maybe in the morning they will come. But why? Again and again, that terrible why. ‘Azzam is a soft-spoken man, born in Susya in 1961; he is eloquent in Arabic and in Hebrew, and here is what he said to us last night as we stood by the tent under the stars that, by the way, you can see better from Susya than in any modern city. A meteor flashed across the sky, and there was a cool wind blowing, and the air was scented with sage and dust and narghileh smoke and good goat-and-lamb smells, and something more, infinitely savory, that I can’t define. First we asked him how he came to speak such perfect Hebrew, and he said: “I was a tahzukan, a maintenance person, for all the big petrol companies in Israel; I worked with them for over twenty years. I’m also a trained electrical engineer with a diploma from a college in Hebron. In those days people in this country still respected one another, and we worked together. I worked for a company where everyone was Palestinian except for the manager; people used to ask him why he employed only Arabs, and he would say that he liked it that way. There are good people and there are bad people everywhere. Today the bad people have power. “I don’t understand them. Where is their humanity? Some basic human feeling. What happened to their Judaism? I’m ashamed of them for your sake. They want to demolish my house because, they say, it was built without a permit. True. But they took away my first home, the cave I was born in, over there [pointing to the archaeological site of Susya with its second-temple-period synagogue], they wrecked it, and then they drove us out. So who is the criminal here? I live on these rock slabs together with the snakes. I paved the entrance way with concrete. Maybe because there is now a flat surface in front of my house they decided they have to wreck it. “I wonder if they can even imagine what life is like here. Have they ever had to live for a whole month without water, have they ever gone begging, for hours, for a glass of water from someone, anyone, out there on the hills? What do they think we want? I can tell you. We want a normal life. A decent home. The settlers over there have stone villas, we live in these tents, which they are coming to destroy. “We love life. We love living. But how can we live like this? They can attack us and destroy our homes, but we will never leave this place. Never. We have lived on these hills for centuries. It’s burning hot in summer, and in winter the rain and the wind sometimes blow away the tents, you know what it’s like here in winter; once the wind lifted us several feet into the air, and we landed on the rocks and mud, without a roof. There was more that I don’t remember, much more. What I remember is the pain, and that strange time-that-is-no-time, or no more time, like a person waiting to be executed, let no one say that a home is not a living being. One waits, and time is too slow and too fast; it has fragility and thickness, its rhythm uneven, out of synch, it fingers your skin and your hair, mocking you, tormenting you. It drives you mad. No-Time, No-Mind, continuous grief. Will I sleep tonight? 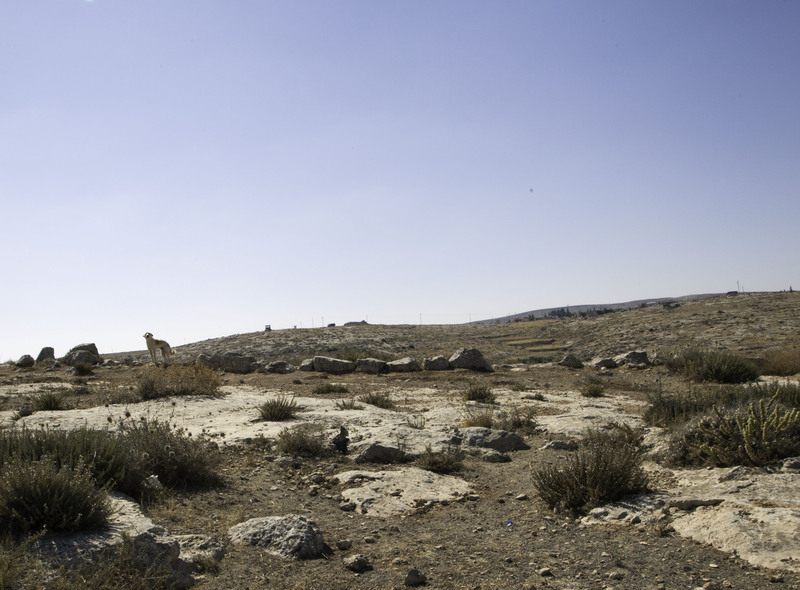 We sit with the men and boys of Susya and with the visitors from Twaneh. Some are smoking narghilehs. They talk about what is happening in al-Khan al-Ahmar. Today there were many arrests and dozens of wounded. The soldiers acted like savages. 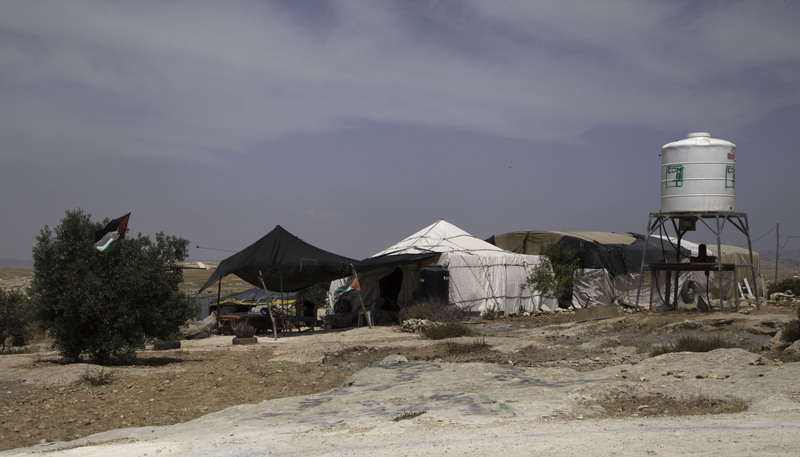 The bulldozers plowed a path from the highway to the tents, to make the expulsion easier. The police tried to persuade the people there that they would be better off if they went peacefully, without protest, into the vehicles that are to dump them, literally, on the Jerusalem dump in Abu Dis. By 6:00 the dogs, the roosters, and the goats are wide awake. Sunrise. Like on any day. The air still cool. We play a kind of soccer with Ahmad and Hamedi, and breakfast comes: the rough pita, omelets, tomato, olive oil and zaatar, tamarind, the sweet South Hebron tea. There were no soldiers invading us at daybreak, their favorite moment, ergo, there will be no demolitions here today. Maybe the army has been deterred by the uproar over al-Khan al-Ahmar. Or maybe not. Anyway, it’s quiet here, an inaudible pastorale. Yigal and I are about to leave for Jerusalem, but first we go to say goodbye to Muhammad Abu-Sadam, whose entire compound is also on the list of immediate targets. We climb the hill to his home. A goat, looking lame and weak, has somehow stumbled out among the rocks. Muhammad cradles him in his arms. Just as we arrive, we get a call: soldiers with demolition equipment have been sighted on their way to Susya. So it’s today, after all. We rush with Nasser to the main road. Five or six army vehicles, a transport truck with bulldozer and crane, some police cars. Suddenly the hills are crawling with soldiers and big guns. Their commander thinks he is god. He speaks, or rather barks, roars, growls, sneers, only in threats. Sometimes he yells. He pokes and pushes us. This is a closed military zone. Get over there or I will arrest you right now. Don’t set foot on the road. Stay over there or you’ll regret it. Don’t ask me questions. I told you not to stand on the road. You’re asking for it. Get away. You’re not allowed to photograph. (He seizes Nasser’s cell phone and slips it into his back pocket.) Only from a distance. I’ll show you where you can stand. You see that hill over there. Photograph from there. I won’t show you the order or the map. You can call the Matak, the guy from the Civil Administration, he’ll tell you… But actually the Matak is there beside him, and he refuses to say a word. He, too, glares at us, a superior being, assured of his eternal prowess. The stench of machismo, vintage army issue, is everywhere. We try to argue, we call the lawyers, the officer refuses to speak with them, he doesn’t give a damn, no map, no photographs, just shut up and stand there or you’ll see what I do to you. He’s a coward, no mistaking it. Is he a human being? I guess so. Does he have a conscience? I don’t know. It’s like staring straight into the hideous face of the Occupation. It’s like seeing things the way they really are. It’s not clear if they’re here for the Big Destruction or not. Meanwhile, the bulldozer goes into action. The home of the family to the north of the main road is demolished. We’re not allowed to see this up close, of course, and there’s no photographic record. The soldiers are rightly afraid of photographs. Later, we see the heap that is what remains when you knock down a home. All this takes time. The women are chanting the Susya song that I have heard many times. One, two, three, four, Susya forevermore. The children keep getting chased off the road. By now it’s hot. We wait. What comes next? Then, surprise, the army cars turn around, the transport truck groans into movement, and they go away. Susya has survived, with losses, one more day. Mufagara is no stranger to demolitions. Two years ago, the soldiers even tore down its mosque, which no doubt counts as a crime under international law. But then everything the army does here is a crime. The bulldozer crawls down the slope toward an unfinished contraption of long iron bars; it bites into the bars as we watch. They collapse. Now the bulldozer and the soldiers collect them and transfer them to the army truck. Young Palestinians, angry, sun-broiled, push forward against the soldiers, who have lost patience and are on the point of violence; an older Palestinian man calls out to the young ones, “Intu aghla min al-hadid: you are more precious than iron.” Those metal rods, by the way, cost a small fortune if you’re a Palestinian shepherd living with your sheep and goats in Mufagara. I don’t know how long today’s trail of devastation, of Little Destruction, stretches. It’s pretty clear that Susya is safe, if that’s the word, for the next few hours. We can go back to Jerusalem. Time-that-is-no-time resumes its choppy flow. Maybe tonight, maybe tomorrow, they will come again. In 1453 the Jews were expelled for the last time from Erfurt. Long before that, in 1290, from England. In 1492 from Spain. Actually, it’s a really long list. We know just how it feels to lose your home. text: @ David Shulman, 2018. photographs @ by photographers, as identified. It is early morning, just before dawn as I read this moving narrative word -by-word, paragraphs accompanied by photographs that make sure that it is about there and I am both there and here. The flow of the writing is calm, how does David control and transmute his righteous rage. I am filled with a sorrowing rage that is at this moment without outlet except tears. I paused in my reading of Hett The Death of Democracy — it happened then and it is happening now . It has all become present. Claude Lanzmann died last week. More perhaps than anyone he contributed to the métier of the civic witness that David and his compagneros practice. One thing a testimony to preserve that which might be obliterated from memory another to be there active in the middle as a matter of civic duty. Forgive my nattering on. Thank you for sharing this with me. Not enough yet still something. Thanks for this comment, and the encouragement. David’s ability to channel rage into beauty is one of many reasons I love working with his prose. As for my photos, I believe this sense of presence, nudging at the reader between paragraphs, which you identify here describes one aim of my text/image relation. Oddly, I have to admit I cannot ignore Lanzmann’s death; I must acknowledge his film Shoah as a way that I learned about visual witnessing and found support and a basis for some of my own relational documentary practices. As a student they were little more than instinctual. Occasionally they can result in a confrontational look like some of Lanzmann’s practices. “Oddly” because my admiration for Lanzmann is in spite of the unquestioned Zionism that leads him to treat Palestinians as no more than staffage, especially in Porquoi Israël – and then of course there is the ending of Shoah. Like many others, Lanzmann shows that it is possible to draw lessons from a great work, even if its author has not learned them himself. I am not a Zionist at all yet Lanzmann remains for me inspirational in the formation of my mature work after philosophy. Shoah is a landmark and that his métier addresses a more and more fascist state established by the victims of the Holocaust as a refuge reveals the sad tragic truth that the children of the book have forgotten the laws of hospitality. “History teaches nothing.” Lanzmann also has curious views about the French peasants that he might have applied to Palesteinian sheperds being dispossessed of their lands by colonialist marauders out of Joseph Conrad and the Wild West. When my Gentile friends find out I’m not a Zionist, they ask how Jews, of all people, can do to other people what was done to them.